It's The SWU's Force Friday II Spectacular! 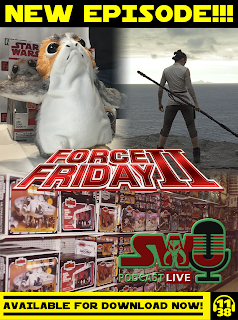 Dominic and Chris report in from midnight madness lines to get you ready for Force Friday, while, Ben is joined by Zac Arnold from the Intergalactic Peace Coalition podcast to break down the week's news. They discuss the recently revealed toys from Sphero, Funko, Hasbro, Lego, and more! Plus, Dominic gives his report from the Propel Star Wars press event in New York City as well as from day one of Fan Expo Canada. They also give their thoughts at the most recent The Last Jedi pics. All this and much more!